Once a cultural status symbol, heavily logo’ed bags now adorn the arms of “It” girls and everyday women alike. Gucci’s double G’s, Fendi’s double F’s, and Louis’ ubiquitous LV logos are too much for the woman seeking individuality. Hogan does understated logos with ease. 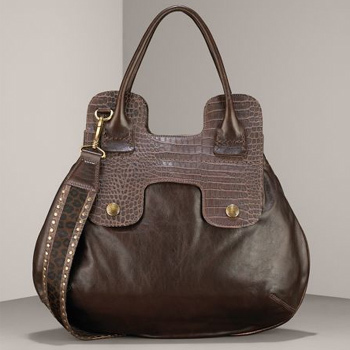 The 'Guitar' Leather Satchel proudly boasts the Hogan “H” without being too obvious. The embossed leather emblem reveals luxury, the modest hardware indicates elegance, and the discreet, detachable leopard print strap is uptown class meets downtown sass.